Evidence is piling up that Blizzard's mysterious Cataclysm is the next expansion for World of Warcraft and that it will include, apparently, two new playable races. In early July, it was reported that PC titan Blizzard had filed a mysterious trademark for something called Cataclysm. All wild speculation that Cataclysm would be a heavy metal MMOG starring Ozzy Osbourne aside, the pieces seem to be falling into place, and it's looking more and more likely that Cataclysm will be the next expansion pack to the MMOG scene's proverbial 800-lb gorilla, World of Warcraft. 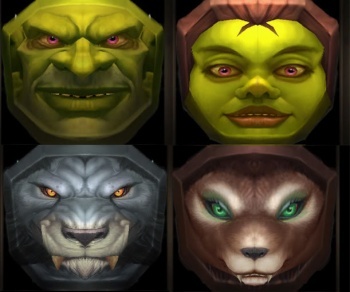 Later in July, some enterprising dataminers found some very interesting information in the latest patch files - brand-new Halloween masks for not just male and female Goblins, but also male and female Worgen (for those of you not familiar with Warcraft lore, Worgen are essentially werewolves). Incidentally, this would be the first-ever appearance of female Worgen in the four-and-a-half-years since WoW went live. Now, WoW.com reports that "multiple sources close to the situation" have confirmed the two new playable races. The Goblins of Undermine will be throwing that pesky neutrality to the wind (well, some of them, anyway) and signing up with the Horde, while the feral Worgen will join the Alliance. The latter of which isn't quite as strange as it seems - it's long been hinted that the populace of the isolated city-state of Gilneas has been afflicted with the Worgen curse, and these details would fit in nicely with an official tease that Gilneas' Greymane Wall would be opening up sooner than we think: "The consequences could be disastrous! We'd be absolutely out of our minds to ever do such a thing......"
Again, this is all just rumor and speculation, but it's looking increasingly likely that Blizzard will have something up their sleeve next weekend at BlizzCon '09 - and we'll be right there to report on it!